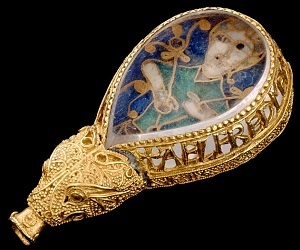 Alfred the Great, perhaps the most famous and most admired of all Anglo-Saxon kings, died on 26 October 899. 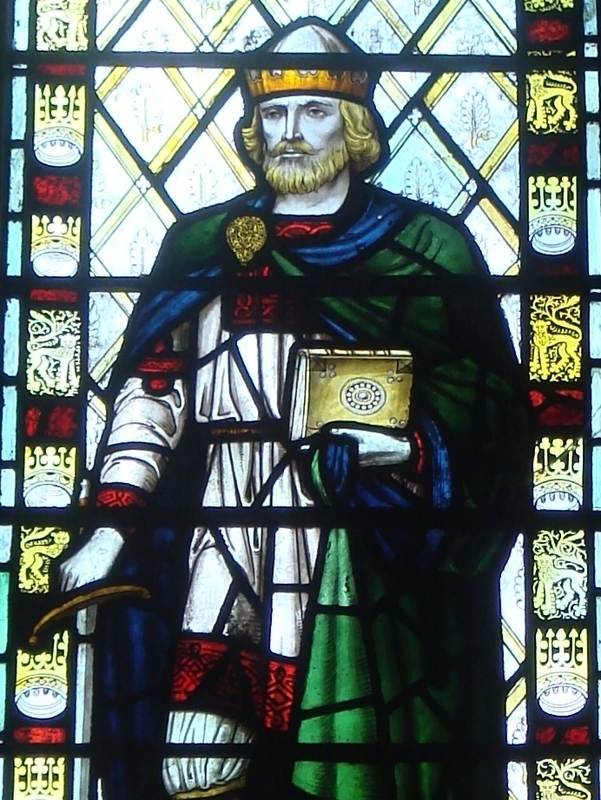 Writing about him a few years ago, I called him 'one of the most attractive figures of Anglo-Saxon history', and many people have found him so - an emblem of the wise and just ruler, thoughtful, scholarly, and devoted to the welfare of his people. His posthumous reputation is so vast and varied that it can be difficult to think or talk about Alfred without being waylaid into discussing by what others have said about him. I've been thinking quite a bit about Alfred lately, partly as a result of having adopted him as the face of Old English Wisdom (it wouldn't feel right to do that without giving some thought to what it means to make use of his image in such a public way), and partly because he is currently appearing on TV in The Last Kingdom. With Alfred it can be hard to steer a middle course between two extremes - to avoid both the Victorian worship of him as a near-perfect warrior-scholar-saint (which that image of Alfred exemplifies) and the modern iconoclastic view that Alfred may have been clever, but religious talk like his is usually fanaticism at best, hypocrisy at worst (which appears to be the view of The Last Kingdom). Both views are products of their own time, of course, and don't tell us much about the ninth century. A good way to counter this problem is go back to the works of literature associated with Alfred's name, and to spend some time with them. What struck me while watching the first few episodes of The Last Kingdom (I haven't read the books) is that it's fairly typical, among attempts to dramatise Anglo-Saxon England for a modern audience, in managing to create the impression of a society without literature. 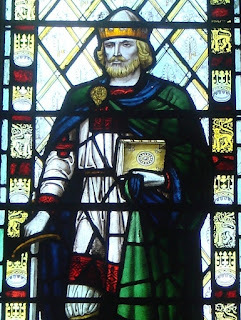 We don't see poets among either the Anglo-Saxons or the Vikings; you'd never know from this that kings employed poets, or that the Ragnar of Scandinavian legend was a poet himself and died with a poem on his lips. Alfred's belief in literacy is presented as entirely functional: he spends his time in a room full of scrolls (not books) which apparently contain notes on troop movements and the names of his enemies, and we hear a priest (!) say that the chief benefit of writing is that letters convey messages more accurately than the spoken word. 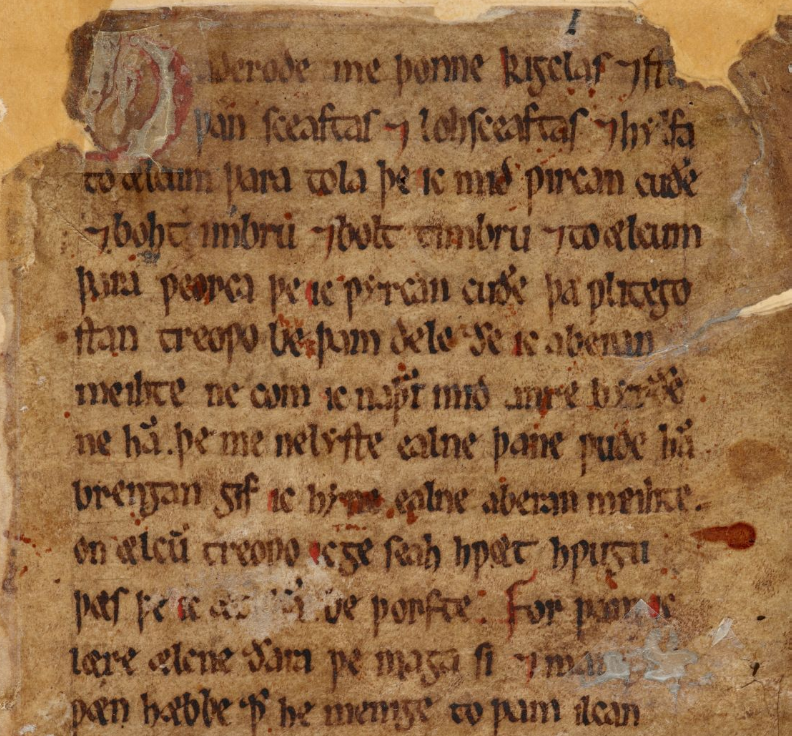 This is an impoverished view of literacy, and not in any way true to the place of literature in Anglo-Saxon England - including Alfred's own thoughts on the subject. Meanwhile, there's little sense of rhetoric or poetry in the dialogue, which alternates between the unimaginative (following the popular though ungrounded assumption that mild profanity is somehow authentically earthy and 'Anglo-Saxon') and the ridiculous (attempts at more elevated language just end up sounding cod-Shakespearean - especially the awful prayers!). 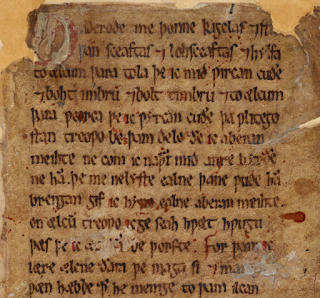 There's a limit to what you can show on screen, of course, but it helps me understand why it's so common to encounter people who believe Anglo-Saxon England produced exactly one poem (Beowulf) and that the Vikings had no literature at all. Watching that brutal, grey-saturated world on screen, you could be forgiven for thinking that the sun never shone in ninth-century England; you could certainly never guess at the range and richness of Old English poetry, the dazzling complexity of skaldic verse, or the serious thought which Alfred's circle were investing in questions of education, language, and literary translation. The works produced at Alfred's court are the earliest extended examples of English prose, and they're not scraps or notes but book-length vernacular versions of complex works of Latin philosophy, translations which respond in sensitive, creative ways to the challenges of their source material. They are the work of a circle of thoughtful readers, writers and scholars, encouraged and supported by royal power. These texts would be fascinating whoever had produced them, but they do have a special charm for being associated with such a figure as Alfred, written with a clear educational purpose, and in the middle of warfare and unimaginable national turmoil. Remarkable enough that such things were written at all, still more remarkable that they should be the priority of a king with Vikings on his borders. We don't know how much (if anything) was written by the king himself, but these texts were issued in his name and in his voice; and there's a kind of consistency in that voice between the various texts, whether it goes under the name Boethius, Augustine, Gregory, or Alfred. It's the voice of a seeker after knowledge, eager, questioning, and humble, sometimes despairing amid the troubles of the world and the consciousness of personal failure, sometimes rejoicing in the quest for wisdom and the pleasures of intellectual and spiritual exploration. Not everyone will find such a voice appealing and sympathetic, but I do; and whether it's Alfred's or not, it's because of him that we can hear it. So here are a few extracts from two of the translations associated with Alfred, among the books he calls 'most needful for all men to know'. They're not representative - they're just passages which particularly touch me. Read them slowly; read them aloud, if you can, because even in translation their long fluid sentences are better for the ear than the eye. [Ic] gaderode me þonne kigclas, and stuþansceaftas, and lohsceaftas, and hylfa to ælcum þara tola þe ic mid wircan cuðe, and bohtimbru and boltimbru to ælcum þara weorca þe ic wyrcan cuðe, þa wlitegostan treowo be þam dele ðe ic aberan meihte. Ne com ic naþer mid anre byrðene ham, þe me ne lyste ealne þane wude ham brengan, gif ic hyne ealne aberan meihte. 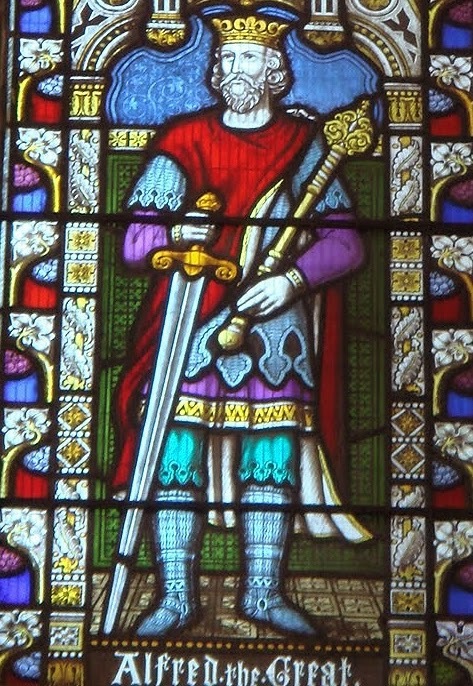 On ælcum treowo ic geseah hwæthwugu þæs þe ic æt ham beþorfte. 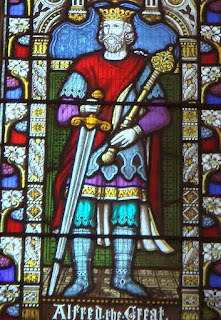 Forþam ic lære ælcne ðara þe maga si and manigne wæn hæbbe, þæt he menige to þam ilcan wuda, þar ic ðas stuðansceaftas cearf, fetige hym þar ma and gefeðrige hys wænas mid fegrum gerdum, þat he mage windan manigne smicerne wah, and manig ænlic hus settan and fegerne tun timbrian þara, and þær murge and softe mid mæge on eardian ægðer ge wintras ge sumeras, swa swa ic nu ne gyt ne dyde. Ac se þe me lærede, þam se wudu licode, se mæg gedon þæt ic softor eardian [mæge] ægðer ge on þisum lænan stoclife be þis wæge ða hwile þe ic on þisse weorulde beo, ge eac on þam ecan hame ðe he us gehaten hefð þurh sanctus Augustinus and sanctus Gregorius and sanctus Ieronimus, and þurh manege oððre halie fædras; swa ic gelyfe eac þæt he gedo for heora ealra earnunge ægðer ge þisne weig gelimpfulran gedo þonne he ær þissum wes, ge huru mines modes eagan to þam ongelihte þæt ic mage rihtne weig aredian to þam ecan hame, and to þam ecan are, and to þare ecan reste þe us gehaten is þurh þa halgan fæderas. Sie swa! Then I gathered for myself staves and posts and tie-shafts, and handles for each of the tools I knew how to work with, and timber for cross-bars and beams for each of the structures I knew how to build, the fairest wood in as much quantity as I could carry. But even so I did not come home with such a burden that I did not wish I could have brought home all the wood, if I could have carried it all. In every tree I saw something which I needed at home. So I advise everyone who is strong and has many wagons to take them to that same wood where I cut these posts, and gather more for himself and load up his wagons with fine timbers, so that he may weave many elegant walls, and establish many a noble house, and build a fine homestead, and there dwell in happiness and peace both summer and winter, as I have never yet done. But he who taught me, to whom this wood was pleasing, may bring it about that I may live in greater comfort, both in this temporary dwelling-place by the roadside while I am in this world, and also in the eternal home which he has promised us through St Augustine and St Gregory and St Jerome and through many other holy fathers; as I believe that, through all their merits, he will both make this road smoother than it was before, and, truly, bring light to the eyes of my mind, that I may find the direct road to that eternal home, and to the eternal mercy, and to the eternal rest which is promised to us through the holy fathers. May it be so! Ðu recst þæt gear and redst þurh þæt gewrixle þara feower tyda, þæt ys, lencten and sumer and herfest and winter; þara wrixlað ælc wyð oððer and hwerfiað, swa þat heora ægðer byð eft emne þat þæt hyt ær wæs, and þær þær hyt ær wes; and swa wrixlað eall tunglai and hwerfiað on þam ylcan wisan, and eft se and ea; on ða ylcan wisan hweorfiað ealle gesceafta. Wrixliað sume þa on oððer wyssan swa þat þa ylcan eft ne cumað þær ðær hy er weron, eallunga swa swa hy er weron, ac cumað oðre for hy, swa swa leaf on treowum, and æpla, græs, and wyrtan, and treoweu foraldiað and forseriað and cumað oððer, grenu wexað, and gearwað, and ripað; for þat hy eft onginnað searian. And swa eall nytenu and fugelas swelces ðe nu ys lang eall to arimmane. Ge furþum manna lichaman forealdiað, swa swa oðre gesceaftas ealdiað; ac swa swa hy ær wurðlicor lybbað þonne treowu oðþe oðre nytenu, swa hy eac weorðfulicor arisað on domes dæge, swa þæt nefre syððan þa lichaman ne geendiað ne ne forealdiað. You rule the year, and govern it through the turning of the four seasons, that is, spring and summer and autumn and winter. These change places, each with another, and turn so that each of them is again exactly what it was before, and where it was before; and likewise all stars turn and change in the same way, and the sea and rivers too. In this way all created things undergo change. But some change in another way, such that the same thing does not come again where it was before, or exactly as it was before, but another comes in its place; as leaves on the trees, and fruits, grass, and plants and trees grow old and dry, and others come, grow green, and reach maturity, and ripen, and with that begin again to wither. And just so do all beasts and birds, in such a way that it would take too long to reckon them all now. And indeed the bodies of men grow old, just as other created things grow old; but just as their lives are more valuable than those of trees or other animals, so they will more worthily arise on Judgement Day, so that never again will the body come to an end or grow old. …is ðearf þæt þu rihte hawie mid modes eagum to Gode, swa rihte swa swa scipes ancerstreng byð aþened on gerihte fram þam scype to þam ancre, and gefastna þa eagan þines modes on Gode swa se ancer byð gefastnod on ðære eorðan. Þeah þæt scyp si ute on ðære sæ on þam yðum, hyt byð gesund [and] untoslegen gyf se streng aþolað, forðam hys byd se oðer ende fast on þære eorðan and se oðer on ðam scype. It is needful that you look with the eyes of the mind straight to God, as straight as a ship's anchor-cable is stretched out direct from the ship to the anchor; and fasten the eyes of your mind on God as the anchor is fastened in the earth. Though the ship may be out on the sea amid the waves, it will be safe and unbroken if the cable holds, because one end is held fast in the earth and the other on the ship. Ðæt sint þa þreo anceras, þe þæt scyp ðæs modes healdað on gemang ðam brogan þara yða. Þæt mod þeah hæfð micle frofre on ðam þe hit gelyfð and geare wot þæt þa ungelimp and þa ungesælþa þisse wurlde ne beoð æce. Swa swa scypes [hlaford], þonne þæt scyp ungetæslicost on ancre rit and seo sæ hreohost byð, ðonne wot he gewiss smelte wedere toweard. These [faith, hope and charity] are the three anchors which hold fast the ship of the mind amid the turmoil of the waves. But the mind has great comfort, because it believes and well knows that the misfortunes and miseries of this world are not eternal; just as the ship's captain knows for certain, when the ship is riding in greatest danger and the sea is at its roughest, that calm weather is coming. What do I know, except that I wish we could know about God as fully as we desire to know? But the mind is weighed down and busied by the body, so that we cannot see with the mind's eyes anything exactly as it is – any more than you can see the sun shine sometimes, when the clouds shoot between it and you; and yet it shines very brightly where it is. And even if there are no clouds between you and it, you can never see it clearly exactly as it is, because you are not where it is, and your body cannot be there, nor can your bodily eyes ever come nearer to it, nor ever see it any closer. Nor even the moon, which is closer to us, can we see just as it is. We know that it is larger than the earth, and yet at times it seems to us no bigger than a shield, because of the distance. Now you have heard that with the eyes of the mind we can never see anything in this world just as it is; but from the part which we can see, we ought to believe the part which we cannot see. But it is promised to us, beyond any doubt, that when we have come out of this world, and the soul is freed from the prison of the body, we will know everything which we now desire to know, and more than the men of old, who were the wisest of all in this world, were able to know. And after Judgement Day it is promised to us that we will see God openly, see all, just as he is, and know him afterwards as fully as he now knows us. After that there will never be any wisdom lacking to us. He will not conceal anything from us, he who grants that we may know his own self. But we will know then all that we now desire to know, and even that which we do not now desire to know. And two extracts from the translation of Boethius' Consolation of Philosophy; first, a reflection on humility (the Old English can be found here). He who wishes to build a secure house should not set it on the highest hill, and he who wishes to seek divine wisdom must not do so with arrogance. Again, he who wishes to build a secure house should not set it on sandbanks, so if you wish to build wisdom, do not set it upon greed, because as the shifting sand swallows the rain, so greed swallows the sinking riches of this world, because it is always thirsty for them. A house cannot stand long on a high mound, if a very violent wind attacks it; nor is it able to stand on the shifting sand because of heavy rain. So too the mind of man is oppressed and moved from its foundations when the wind of heavy troubles disturbs it, or the rain of great anxiety. But he who wishes to have eternal happiness should flee the perilous splendour of this world, and build the house of his mind on the stable rock of humility. For Christ dwells in the valley of humility, and in the memory of wisdom. And so the wise man ever leads all his life in joy, unchangeable and free from care, when he forsakes both the good things of earth and its evils, and hopes for those to come, which are eternal. For God upholds him everywhere, continually dwelling in his mind's joys, though the wind of troubles and the continual care of worldly goods may blow upon him. O Reason, truly you know that greed and the greatness of worldly power were never pleasing to me, nor did I much desire this worldly authority. But, indeed, I desired to have the materials for the work which I was commanded to carry out, that was, that I might honourably and appropriately guide and exercise the power which was committed to me. Truly you know that no one can show any skill, nor exercise or guide any power, without tools and materials - that is, the materials of each craft, without which the craft cannot be performed. These, then, are a king's materials and the tools he has to rule with: that he has his land well peopled; he must have men to pray, and soldiers, and workmen. Indeed, you know that without these tools no king can perform his craft. These too are his materials, which he must have as well as the tools: provisions for the three groups, and this is their provision: land to live in, and gifts, and weapons, and food, and ale, and clothes, and whatever is necessary for the three groups... Therefore I desired materials with which to exercise that power, so that my skills and power should not be forgotten and concealed. For every skill and every power quickly becomes old and is not spoken of, if it is without wisdom; because whatever is done in folly cannot ever be reckoned as skill. This is now especially to be said: that I desired to live worthily while I lived, and after my life to leave to those who came after me my memory in good works.